Stop 2 of the dineLA progressive dinner: Bouchon Beverly Hills. This week, dineLA threw a party in Beverly Hills introducing the upcoming 2013 dineLA restaurant week (July 15-July 26) to some media folks. And, damn, they sure know how to impress those who’ve already seen it all. At first I figured we’d sample some eats at the featured restaurants — Scarpetta, Bouchon Beverly Hills and Patina — but it turned out to be a night of wow. How’d they do it? Well, if you’re ever thinking of throwing your own party that will impress the jaded, follow these simple steps. 1) Hire Simon Ford to tend your bar. Simon Ford is a class act and his name is synonymous with “quality booze” as evidenced by his years as an award-winning brand ambassador for Pernod Ricard and “cocktail knowhow” as demonstrated in his work on Liquor.com. 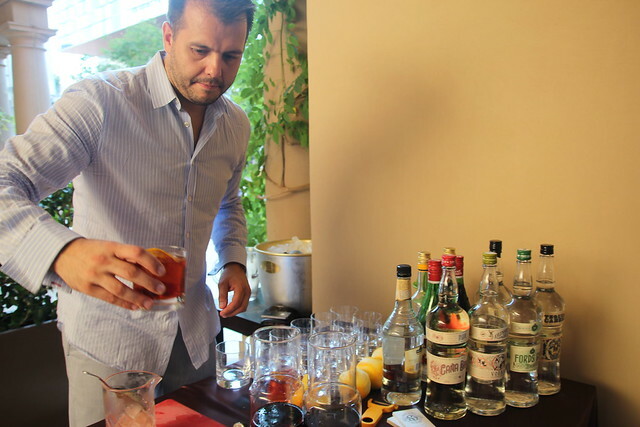 He also has co-founded his own bartender-friendly liquor line called The 86 Company, which he showcased at the dineLA party. At Scarpetta we enjoyed Ford’s Gin Negroni variations, because what better way to kickoff a week of eating than with the best aperitivo cocktail out there? At Bouchon it was a Hemingway Daiquiri with Cana Brava Rum. I don’t think an average Schmo (like me) can actually hire Simon to tend their bar and that’s why it’s a big deal to see him serving up the drinks. 2) Use Uber to safely transport your guests. Styling in an Uber on the way to the dineLA party. So, because of 1 then 2. I knew something was up when dineLA offered to Uber every one of its party guests to the event. I mean, how much did they think we’d drink at a food event? But when I saw Simon it all made sense. In any case, Uber is working with dineLA restaurant week where diners who make restaurant week reservations will get $20 off their first Uber ride. If you’re going to drink, and you will, having a designated driver at the ready is always a good idea. Out of the many car service apps out there, Uber is definitely the classiest thanks to its employment of off-duty chauffeurs. 3) Keep changing the scenery. At the dineLA event we were never allowed to really settle in as it was a progressive dinner moving us from location to location. So we were never bored and our seat mates were always someone new. The event kicked off on the patio at Scarpetta for cocktails and an abbreviated meal of that infamous bread basket (vegetarian stromboli!!) and an entree (yay, spaghetti). We then moved on to Bouchon for some bites in the kitchen, oysters in the bar and then a family style meal in the dining room. We then finished up with dessert on the Beverly Canon Gardens lawn with Patina. Class-ay! 4) Three words: Free-flowing booze. This is a given for any party and yet, sadly, not many people realize its importance. But it really does make the party something extra special. At the dineLA event, in addition to the cocktails by Simon Ford, guests were also offered wine while we sat down to eat at Scarpetta and Bouchon. Ahh, this is where having Uber as backup came into play. Totally fun! Topped it off by going to 10 Pound after. Looks like an awesome event. Really original take on covering what you experienced. Great job.